Homerun Youth Softball Fences, 471 ft of Fencing | EASY Install! Want Free Ground Sockets with your Fence? ...AND Free Shipping? 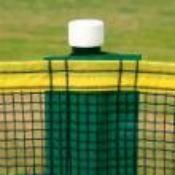 Create a home run fence without gaps or overlap 300' from the plate. Optional Patented ground sockets Available in sets of 16, 32, 48. The industry standard for easy set-up and take down. Homerun Youth Softball Fences: Revolutionary Enduro Fencing is now available fabricated in one piece to create a home run fence without gaps or overlap 300' from the plate. ✔ 471 ft. of fencing ✔ 48 poles ✔ pilot hole tool... and 300 ft tape measure (NOTE: only 1 per ORDER) to assist with proper pole layout. OPTIONAL ground sockets available in sets of 16, 32 or 48. Note: This popular item has an approximate 2 week lead time. Please keep this in mind when placing your order.